Barclaycard US, Green Dot, and Silicon Valley Bank as well as six credit unions have joined Discover in adding support for the NFC mobile wallet. 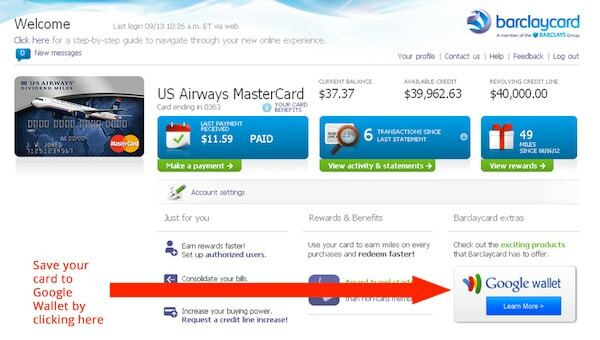 BARCLAYCARD: Cardholders can add their card to Google Wallet online. Click to enlarge. A number of card issuers have announced their support for Google Wallet, using the “Save to Wallet” API released in June. The API is designed to make it easy for cardholders to add cards to Google Wallet and provide a simple “click-to-add” process that can be made available to cardholders via a card issuer’s website, their Google account online or the Google Wallet app on their Android NFC phone. Discover announced last month that its cardholders could add their cards to Google Wallet using the Save to Wallet API and it has now been joined by Barclaycard US as well as, in a lesser implementation, six credit unions. Barclaycard US has now agreed to begin offering Google Wallet to holders of its LL Bean and US Airways co-branded cards. Additional programs will be enabled “in the future”, the card issuer says. Green Dot, Silicon Valley Bank and the six credit unions, who are all members of credit union service organisation PSCU, are taking a less complex approach to participating in Google Wallet, meanwhile. Arkansas Federal Credit Union, BCU, CFE Federal Credit Union, GTE Financial, TruMark Financial Credit Union and Vantage Credit Union are using the card art option available through the Save to Wallet API, rather than actually provisioning their cards onto handsets. Here, transactions are conducted using the new proxy MasterCard, announced as part of Google Wallet 2.0 last month, and passed through to the cardholder’s choice of funding instrument. Using card art acts as a reminder to the consumer of their payment options rather than being a direct payment option itself. “Card art is an important representation of your bank’s brand, and by adding your card art to Google Wallet, you help Wallet users recognize their cards,” says Google.